Kelly Clarkson is a Christmas pusher. It's not even October yet and I've already created two holiday playlist. Usually, I have Christina Aguilera to blame for any premature Christmas jam-fest, but this year, the blame falls solely on Miss Clarkson and her Wrapped in Red CD. Darn you, Kelly, and your insanely addictive music and incredible vocal abilities. Needless to say, I've been feeling extra Christmassy, despite the 90 degree temps, and decided to add a little red and green to today's look in the spirit of untimely celebration. Speaking of holidays... Shopping for adorable and unique gifts for loved ones is one of the most rewarding (and sometimes frustrating) challenges we all have to face. Thankfully, gift giving just got a little easier. 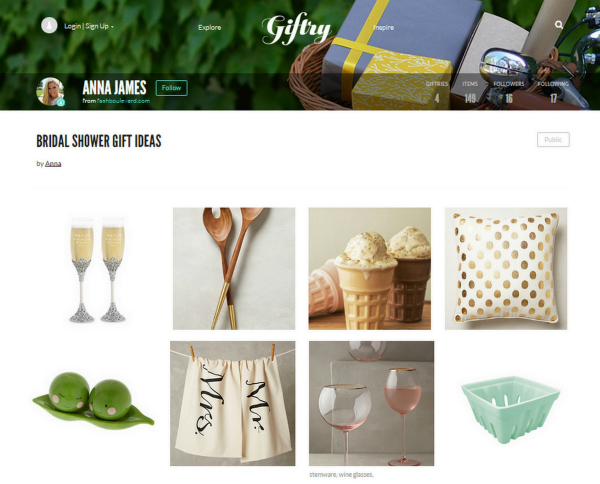 I'm super excited to share the launch of a seriously game-changing gift giving site called, Giftry, which allows you to create curated Giftries (gift wishlists) full of fabulous gift ideas for yourself and your favorite people. I was honored to be one of the Giftry influencers to have the pleasure of playing around on the site before its launch. After using Giftry for the past month, I'm positive you guys will absolutely love it. 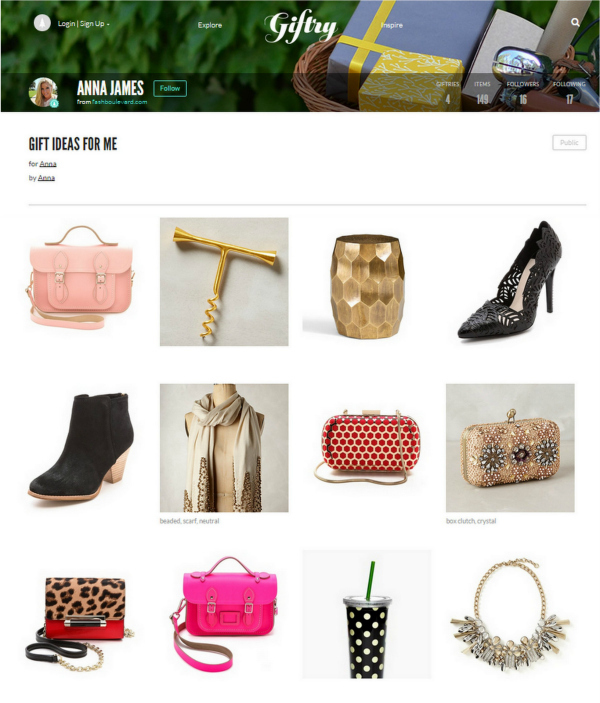 Giftry makes the seemingly endless gift search fun again. The site pretty much takes the guesswork out of gifting. Below are two of the many boards I've already created, one with gifts that I would love to have (take note loved ones) and one featuring fabulous bridal shower gifts. Join Giftry for free today and be sure to check out my Giftry boards here for more giftspiration! wow amazing skirt, I love it!!! omg!!!!! wow!!!!! love this look, sweety)))))) skirt n heels r perfect!!! mix of colors is amazin!!!! The site sounds amazing. I'll have to check it out. And LOVE this outfit, dear. Giftry sounds awesome. Thanks for the rec. Such a gorgeous skirt on you! Wow! That skirt looks adorable on you and I love the color. Great statement piece too:) Thanks for stopping by ! What an amazing outfit! Your skirt is gorgeous and I love it paired with the denim top and red heels! Such a stunning look! Thanks for stopping by! This is fabulous, everything about it! Love it! I love the skirt paired with the top and I need that necklace! Hope you have a wonderful day! That skirt is soooo fabulous! Perfect for the holidays! You look gorgeous! Love that skirt and those shoes! Stunning! This is such a pretty look. I especially love the clutch!! You look like a modern day princess!! :) Gorgeous skirt, I'm in love with it! Thanks for stopping by my blog and for your nice comment! You look fabulous in that skirt! What a fun statement piece. Giftry sounds like a really interesting concept and I can't wait to check it out. I am gifting-challenged so I need all the help I can get. I love the the fade on that shirt! The tulle skirt is so much fun. I would have never thought to pair it with the red heels, but I love it! Thanks so much for stopping by my blog. Love love love this skirt paired with those heels! I absolutely love this look! I really want a skirt like that, it's gorgeous! Thank you for the beautiful post and visiting my blog too! What an amazing skirt Miss! The colour combo with the pumps is amazing! This site sounds really cool. It sounds like pinterest for gifts. Thanks for sharing this new company with me, I'm definitely going to use it to tackle holiday shopping. LOVE this skirt, it's been in my ASOS cart for ages and for some reason I still haven't pulled the trigger! Stunning! Oh my goodness you are the cutest! Also I am always ready for Christmas! So glad to hear I'm not alone. lol. Happy early birthday! I've already purchased two Christmas gifts! Shopping earlier is so much better for our budget, that way it's not all at once! I am loving your skirt! It's so feminine and the length is great! Thanks for visiting SHE! That skirt is so pretty, love the color! I love this big poofy skirt with the cute ombre denim shirt. The shoes are fabulous too! Love the tulle skirt! Very pretty!! Amazing outfit! Love the tulle skirt!! The tulle skirt is AMAZING! I really love the color combo, and those heels are perfection! Your outfit just makes me happy. I love the tulle skirt/chambray combo. You look amazing. I'm obsessed with that skirt, oh my god. You look fab! Love this outfit and this site. Kinda like mini pinterest, except with things people can actually buy you. I like it. Looking fab as always. Such a cute skirt! Love how you pulled this look together! What a sweet look! Love this skirt! So fun! There is something about chambray and tulle that is perfect! You look gorgeous! Everything about this is great!! I've been wanting to put together a chambray and tulle look myself! I'm thinking of making a skirt, but it's just a matter of making time for it!! Such a beautiful skirt, you look so effortlessly stylish! Love this idea! Why hasn't this been created sooner! So much fun. plus, I love this teal skirt on you, mixed with the little red heels so pretty. So lovely! I've never seen a tulle skirt that color. Very unique and I love how you styled it. This skirt is phenomenal! You look beautiful. Love your necklace and skirt! This is such a fab look! In love with that tulle skirt -- and that necklace. You look stunning! I love that skirt!! I Have been wanting one like that for a while!! Girl, I am totally smitten with that tulle skirt. This is such a pretty look. LOVE it with those red heels! So pretty. I'm so obsessed with that skirt!! I am obsessed with that skirt！reallt great styling. The outfit is perfection! Never would have thought to pair a denim shirt and tulle skirt, but it works ridiculously well, amazing. Girl, I can't not have this skirt. The color is so great. And Giftry sounds fab. Can't wait to ceck it out. Such a fun look! I can't help but think of SATC when I see it. The color of the skirt is beautiful! It's hard not to start thinking about, and obsessing over the holidays - love this skirt on you! That necklace though, WoW ! The skirt is gorgeous! I saw it on asos a couple of days ago, but it looked too sheer... What are you wearing beneath it? YOU look amazing! I love that skirt & your blog. 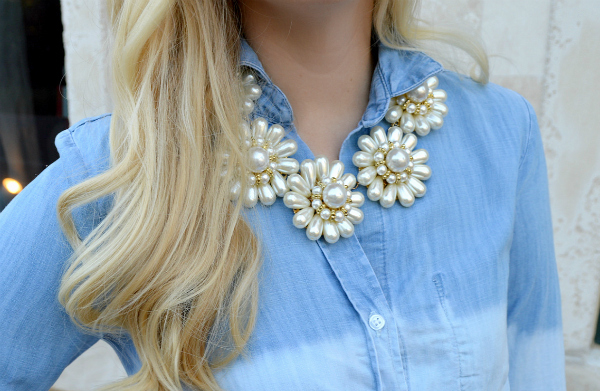 that pearl necklace is all sorts of amazing!